Eight adults, each for their own reasons, reach the point they feel abandoning their homes in Sweden in favor of enduring a treacherous sea voyage to New York is the only way to find a dignified life for themselves and their eight children. The sixteen featured emigrants joined more than sixty other courageous souls on a journey they knew almost nothing about for a new life in a land they had only heard of. They knew no one who had made the journey before. Many among them lost their faith, and some even their lives, before the small ship arrived in New York harbor. 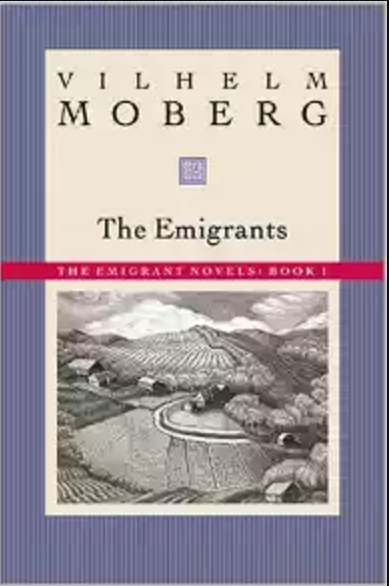 Moberg’s The Emigrants brings the bleak conditions of mid-nineteenth century Scandinavia to life, uncovering the near starvation facing families whose ancestral homes had been divided into plots so small they no longer could support the same, or in many cases an even larger, number of people. While not mentioned in Moberg’s work, mortality rates in Sweden began declining in the latter half of the seventeenth century which contributed to the challenges. Intolerance of divergent forms of worship, societal shaming of non-conforming individuals, and unhappy marriages also contributed to the motivation of those earliest pioneers seeking a better life in North America. The first half of the novel painted a richly detailed landscape of the conditions, especially of the hunger the children faced and the pain those conditions brought to the adults who could not overcome the conditions that brought on the hunger. The last half of the novel, describing the sea voyage and the disease and unhealthy conditions the travelers had to endure, was equally well detailed but felt a bit longer than I thought necessary, the reason I rated the book four stars, not five. Having already read O.E. Rolvaag’s Norwegian trilogy beginning with Giants in the Earth, I was eager to compare The Emigrants to it. Moberg’s work is like a prequel to Rolvaag’s work, and since Sweden and Norway were ruled by the same monarch during the timespan of both author’s tales, I felt the circumstances that prompted both Norwegian and Swedish emigration were likely very similar. For anyone who wants to know more about the emigration/immigration of ancestors from Scandinavia, I would recommend this book wholeheartedly.